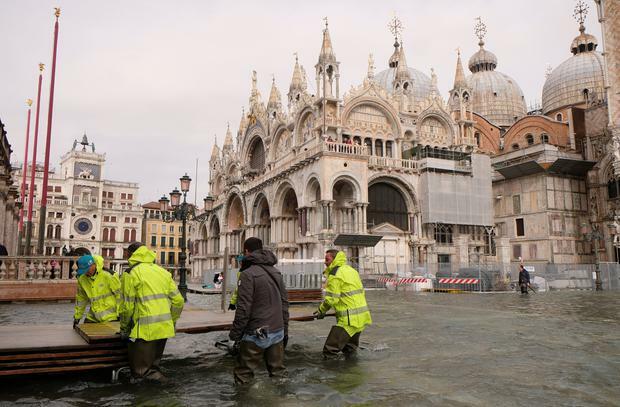 St Mark’s Basilica in Venice needs urgent funding to save its precious marble and mosaic floor after flood water did decades worth of damage in a day, officials have warned. The Catholic cathedral, which attracts more than five million visitors a year, was filled with nearly three feet of water at the end of October in some of the worst flooding in the city since 1872. Carlo Alberto Tesserin, the cathedral’s procurator, or administrator, said the church had “aged 20 years in a day” and estimated that initial repairs would cost €2.7m. In a statement at the weekend, the procurator’s office said it had spent around €700,000 to begin the restoration, but was asking for “a specific undertaking from the Italian government for the remaining €2m”. Venice was inundated for several days in October as “acqua alta” or high water, rose more than five feet. Torrential rains and heavy winds swept across Italy, killing 29 and causing widespread damage.